As I sit here in the Vientiane international airport I think it is finally hitting me that my life as I know it for the last six weeks is coming to an end. I can remember it just like it was yesterday, I remember the tear filled good bye at the airport, the exhaustingly long flight to just get to Korea then another long flight to get to laos, and when I walked into our room at Senghpachan Hotel 2 texting my mom telling her I arrived safe and sound then getting a text back saying “welcome home for the next six weeks”. These last six weeks have definitely been an adventure but an amazing once in a lifetime adventure that I wouldn’t trade for anything. 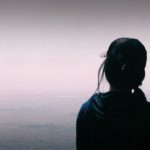 It took me forever to decide on my topic for this blog….well if I’m being honest I finally just choose what I was going to write about when I started it. 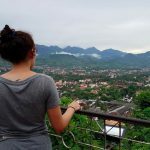 The most memorable part of the trip for me was our weekend trip to Luang Prabang so it just seems right that I would make this all about that weekend. 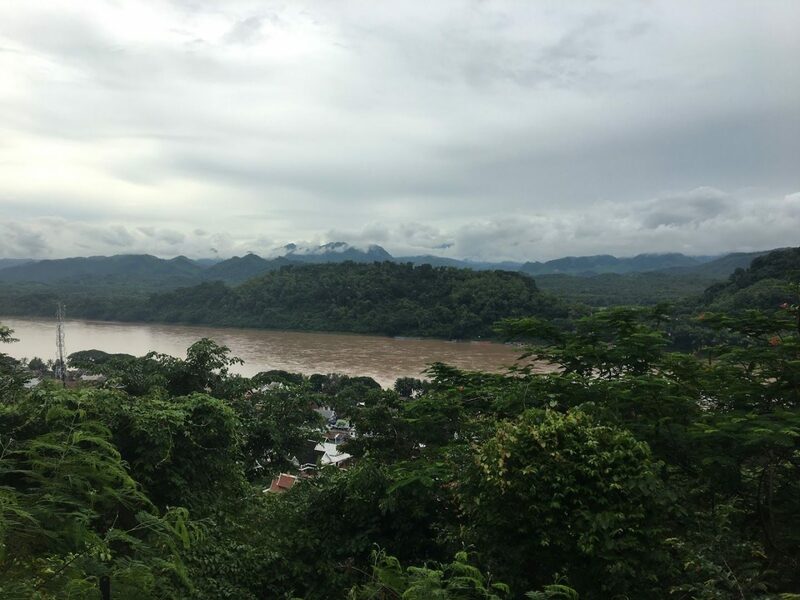 So we were originally scheduled to take a night bus down to the southern city of Paxay like all other SAILers have done in the past but Lada our Lao coordinator made the suggestion that we should see about making the trip up to Luang Prabang instead of Paxay. Lada did some of her magic working and talked with the sail program leaders and was able to get the approval for all of us to head up north, the only thing was a problem was that we all had to pitch in $50 to cover the rest of the plane ticket price and when you are a traveling student $50 is a good chunk of change. We all decided that we would probably never have the opportunity to fly up north again so we decided to splurge and spend that $50. Can I just say that that $50 could not have been spent on anything else that would have been as amazing as Luang Prabang. Our first day we took a shuttle from the airport to our guest house. As we checked in we were greeted with smiles, welcome drinks, and an owner that was more than eager to practice speaking English with us as we practiced speaking lao with her. Later that day we all made our way to Wat Xieng Thong a temple that is arguably the most beautiful temple in all of Laos. 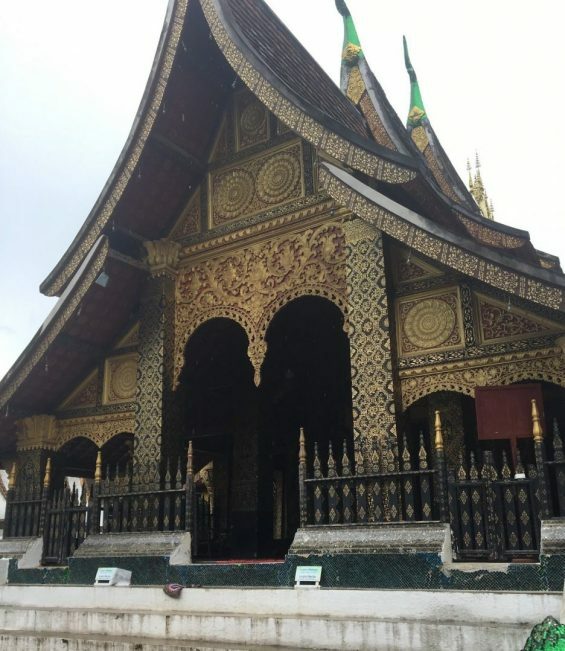 We then took a cute little tuk-tuk to the royal palace where the old kings belongings are still to this day preserved just like he and the royal family left them as they fled the city. Then we walked across the street where we took the first step of three hundred and fifty five steps that would lead to the top of Mount Phousi. About twenty steps up there was a stand selling little finches in tiny wooden cages that you could buy then once you bought them release them at the top of the mountain. Me being an animal lover I had to buy at least a few to release them. When we reached the last step of the three hundred and fifty five steps I began to feel sick again like I had been the last few days in Vientiane before we left on the weekend getaway, let’s just say that was the end of the day for me and I headed back to the guesthouse as the other SAILers went and browsed through the red tents of the night market. The second day in luang prabang was a pretty uneventful relaxing day where was just rented a few bikes and explored the new town on bikes. The third day was the day that we were all going to the waterfalls!!! 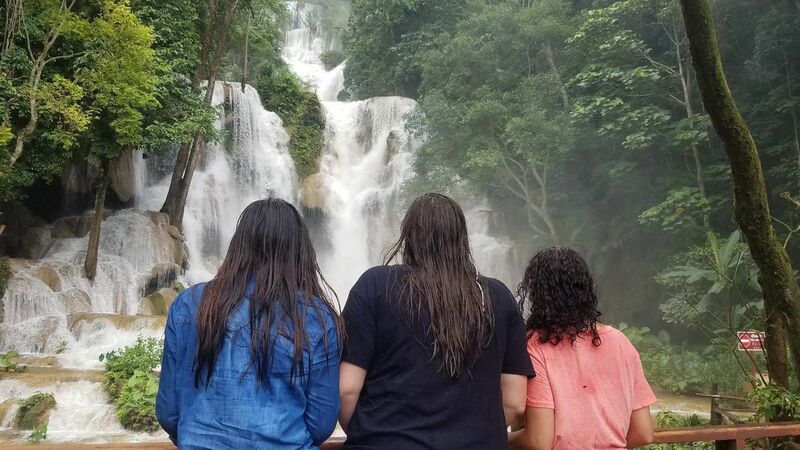 All I can say is Laos hands down has the most beautiful waterfalls ever. Pretty much that entire day we just lounged around and enjoyed the cooler water that gave us a break from Laos’ crazy humid heat. The fourth day is where it gets pretty exciting. 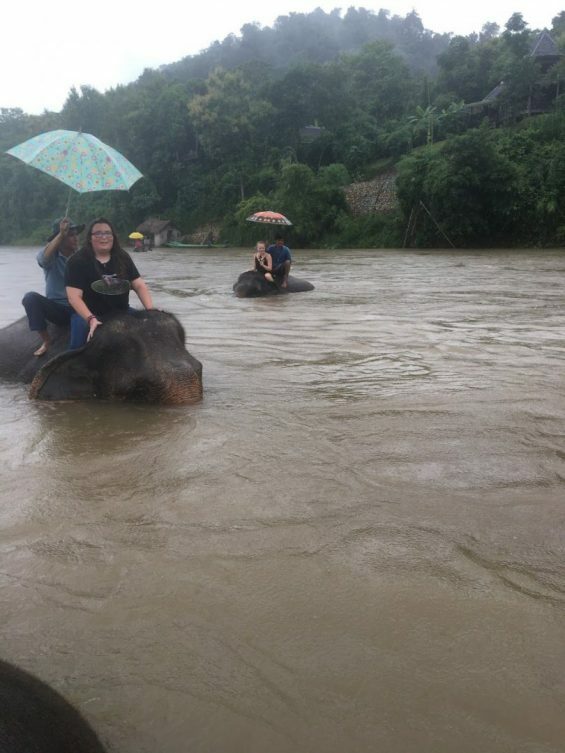 Myself and two other SAILers decided to book ourselves an elephant riding excursion. 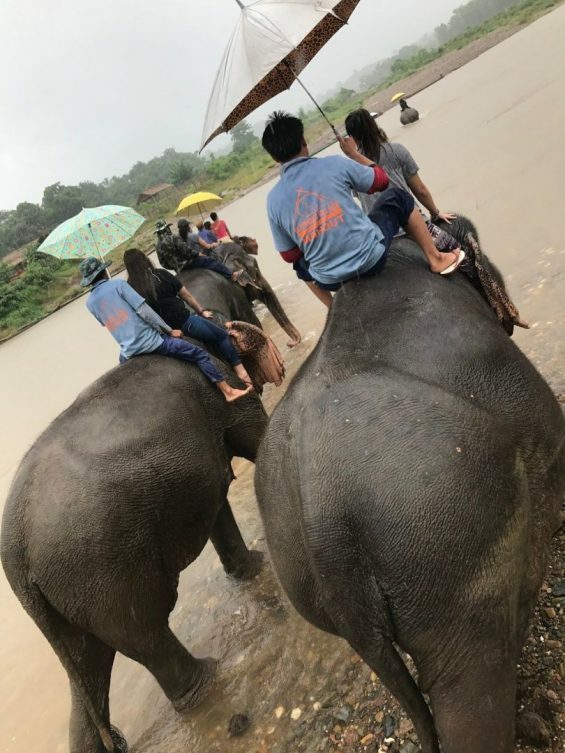 We were picked up around eight in the morning at our guesthouse then we went and picked up the rest of the tourists that also booked that the same excursion. We then took a forty five minute van ride but a long narrow curvy road to this cute little elephant village and hospital. When we first arrived we were allowed some time to go take pictures and feed the elephants we then had a short briefing on what the schedule was for the day then we were off. After the first ten seconds on the elephant I realized I was in for an adventure! the plane bound for Vientiane. Now as I sit here putting the finishing touches on this blog in my house back stateside it all seems like a crazy dream that I woke up too early from.